Is absorbed into the ground and eventually seeps through into the groundwater (known as infiltration). Surface water is the water that flows on the surface of the earth, as in the first and second point above. But groundwater is different. Groundwater is found underground in the cracks and spaces in rocks, soils and sands. Imagine pouring a glass of water onto a pile of sand. Where does the water go? The water moves into the spaces between the particles of sand. Groundwater is the same. Groundwater is stored in, and moves slowly through layers of soil, sand and rocks called aquifers. Heavy rains or melting snow may cause the water table to rise as more water is stored in the aquifer. An extended period of dry weather may cause the water table to fall, as less water is stored in the aquifer. The speed at which groundwater flows depends on the size of the spaces in the soil or rock and how well the spaces are connected. It may move several hundred metres a year in fractured limestone rock, or only move several centimetres a year through clay. In our area groundwater eventually flows into creek, a river or even into Lake Ontario itself. In many communities, groundwater is the sole source of water. In the Credit River Watershed, our municipalities are the largest consumers of groundwater, providing it to their local communities from underground wells. 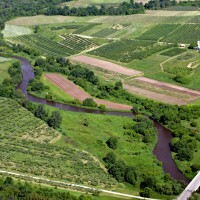 Recently, people have become concerned about the removal of water from watersheds by other, human-caused, means. These include diversions (damming or changing the course of a river to increase or decrease water supplies elsewhere) and removal (losing water by shipping it out as bottled water or in agricultural products high in water).